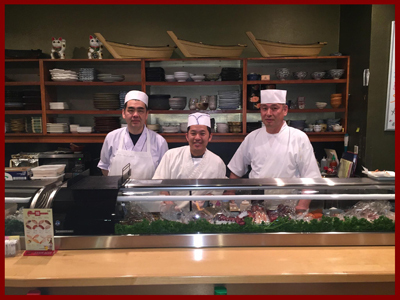 Nestled in the center of the two towers of Park Square in Uptown, our Japanese owned and operated restaurant has been serving Albuquerque at this location for over 20 years. For a quieter, more intimate dining experience our patrons can dine at the sushi bar where fresh seafood and a more traditional Japanese menu awaits. For a livelier, more entertaining dining experience, where our chefs prepare your meal right before your eyes while putting on a show, join us at our steakhouse. We are the original teppanyaki/hibachi style restaurant in the state of New Mexico and have some of the most experienced chefs in town. We hand trim and cut all of our meats, vegetables, and seafood to ensure the quality. All of our sauces and dressings are made in house as well. We have won numerous awards over the years, most recently Albuquerque the Magazine’s Best of the City 2013, 2014, and 2015 for Best Japanese Restaurant, Local IQ’s Smart List 2012-2014 for Best Japanese Restaurant, and Weekly Alibi’s Best of Burque 2012 and 2014 for Best Japanese. We have accomplished this with little to no advertising and have only our wonderful customers to thank for these awards. We strive to provide the most memorable dining experience possible. We thank our guests for their continued patronage over the years and would like to invite all to come in and enjoy a dining experience you won’t soon forget.